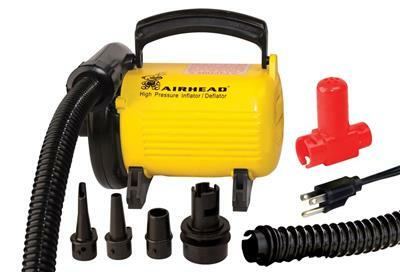 You’ll enjoy the performance of this 120-volt air pump. It inflates and deflates quickly and effectively. Peak pressure is 2.5 psi, plenty of pressure to get items nice and firm. A Pressure Release Valve is included to limit pressure to 1.4 psi for preventing over-inflating. The accordion-style hose locks onto the pump, eliminating annoying disconnections. Four universal valve fittings fit all popular valves and lock onto the hose. You’ll love the screw-on Boston Valve adapter, an AIRHEAD exclusive. For added convenience, there’s a carry handle and a 10 ft. long power cord. Draws 6.1 amps / 730 watts. Volume is 460 liters/minute. Perfect for inflating and deflating Drums Alive Stability balls quickly!